The progress of the EFRA Project to construct a huge complex of units in the Grupa LOTOS refinery reached a halfway point taking into account the design, supply as well as construction and assembly work. A huge crane has placed the largest and heaviest reactors and distillation columns a top high foundations. Among the gigantic elements put in place, the heaviest are the hydrowax distillation column weighing in at 300 tonnes and two coke drums weighing 290 tonnes each. Heavy lifting, the most spectacular task under the EFRA Project, is finished.Most construction work was entrusted to Polish workers. Most headway has been made in design work (95% complete), conducted primarily in Italy at the offices of KT – Kinetics Technology (KT), the general contractor for most units under EFRA, engaged by LOTOS Asfalt, the investor and future operator of the units, in July 2015. In early October, the cornerstone was laid and pile driving commenced on the site of the first and already completed structure under EFRA, the power distribution facility. Design work in the merger of new and existing units is made by Fluor. Also in this case the work is coming to a close. The percentage of completed procurement and supplies under EFRA has exceeded 86%. 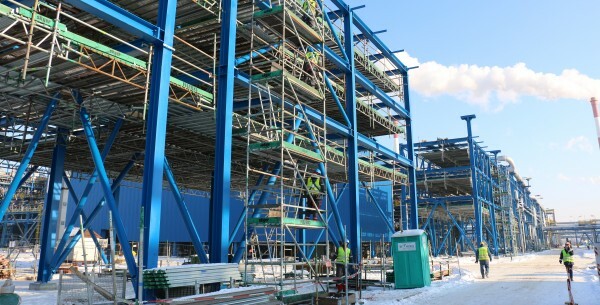 Numerous elements of various units have been stored around the construction sites awaiting assembly. Construction and assembly work completed in approx. 25%. Main construction work has already been finished, with the elements of the main Delayed Coking Unit towering above the refinery. Particularly conspicuous are two huge coke drums surrounded by steel structure. The coking technology will enable the production of about 300 kg of coke and 700 kg of fuels from each tonne of heavy residue. One additional innovation, full air-tightness, will make the coking process and transportation of coke compliant with environmental requirements. “After completion of the EFRA Project, LOTOS refinery in Gdansk will strengthen its position as one of the most modern of its kind in the world producing the highest quality fuels,” said Mateusz Aleksander Bonca, Vice President of the Management Board for Strategy and Development of Grupa LOTOS S.A. “Our key priority is eliminating heavy fuel oil from our products. It is harmful to the environment and unprofitable as it is sold at a negative margin, at a price lower than the price of crude oil. As we are implementing the most innovative and environmentally-friendly version of coking technology, we will be able to achieve deeper conversion, translating into a higher yield of high-margin fuel from the same amount of crude oil. We estimate that annually this should bring us 900,000 tonnes of high-quality motor fuels more. In addition, this will boost our refining margin by some 2 dollars per barrel, with the Solomon Complexity Index, the best measure of a refinery’s efficiency, improving from 9.5 to 10.6 points, the highest of any European refineries,” he added. The key elements of the EFRA Project are the Coking Complex, comprising the Delayed Coking Unit, Coker Naphtha Hydrotreating Unit, and Coke Storage and Logistics Facility. Other units to be built are the Hydrogen Generation Unit, Hydrowax Vacuum Distillation Unit, and the Oxygen Generation Unit. Furthermore, many existing units will be upgraded and have increased production capacities. Piling work has already been completed, with 3,822 reinforced concrete piles firmly driven into the low-bearing soil, providing support for structures weighing thousands of tonnes. Construction work to date has consumed 21,500 tonnes of concrete (out of the planned 24,400 tonnes) and saw the erection of 2,700 tonnes of steel structure (out of the planned 5,000 tonnes). Around 7500 tonnes of pipelines (220 km) have been made available for prefabrication. EUR 211m (41% of the Project’s budget) was expended by the end of January. The number of man-hours spent on the Project without the events resulting employee sick leave reached 1.3 million. In January, over 1,200 people were busy on the construction sites, and in March the workforce will exceed 1,500. Moreover, from March 3rd to April 15th, an additional 3,000 workers from Polish companies will join the effort at the refinery due to a maintenance shutdown which will see EFRA units connected to the refinery. Most construction work under the EFRA Project was entrusted to Polish workers as subcontractors of KT or contractors hired directly by Grupa LOTOS. It is Mostostal Zabrze, Mostostal Płock, KB Pomorze, Strabag, Keller Polska, Przembud Gdańsk, Elektromontaż Gdańsk, LOTOS Serwis, Energoaparatura, ABB, Uniserv-Piecbud, Tebodin and many more. It should also be noted that a large part of procurement and supplies is carried out by Polish companies (Mostostal Siedlce, Pekabex, among others). The EFRA Project is slated for completion in the second quarter of 2018. The entire investment process completes the technological test of new and existing units combined into one oil processing line. The EFRA Project, whose implementation commenced in October 2015, provides for the construction of a complex of interconnected deep conversion units. With the new production units, LOTOS’ refinery in Gdańsk will gain innovative technologies and enter the group of the most modern plants of this type in the world. Once the EFRA Project is completed, LOTOS’ refinery will increase its annual fuels output by 900 thousand tonnes and will manufacture 300 thousand tonnes of coke per year. The project is expected to increase the actual refining margin by some USD 2 per each barrel of oil processed. KT – Kinetics Technology (KT) is a company of the Maire Tecnimont group, an international leader in industrial engineering, procurement and construction (EPC) contractor and provider of technologies and licences. The group, listed on the Milan Stock Exchange, carries out its business in more than 30 countries. KT is an international engineering company with an extensive track record in the refining and chemical industries. Its business consists in providing technologies and EPC construction of refining, gas and chemical units.